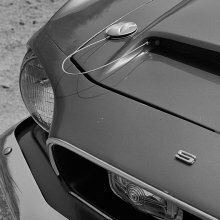 Home » Research » Evolution of the "1968 Photographic Cars"
Since this project began in 2009, we were able to find and catalog nearly 100 high-resolution photos of the '67 Shelby G.T. 500 Convertible. In the beginning, this was no easy project -- in every photo, the cars were disguised to look like 1968 models. Once we knew what we were looking for, the process became considerably easier. 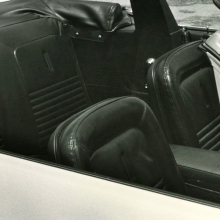 Careful scrutiny of these photographs allowed us to identify and document that there was more than one iteration of the '68 styling treatment over the course of a few months. 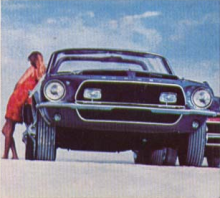 There were two "1968 Photographic Cars," (a/k/a "Advertising Cars") one convertible and one fastback. 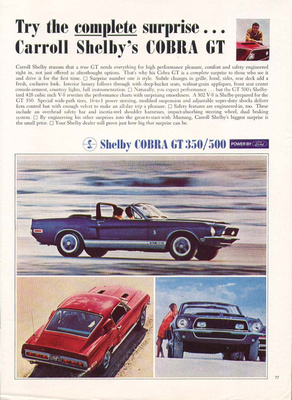 Based on the timeline we now know, we can conclude that the emblem V1 -> V2 changes came after Ford's decision to terminate California-based Shelby Program on May 26, 1967. 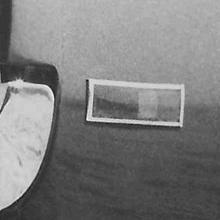 Many of the Version 1 (V1) photographs were later "airbrushed" (retouched) for use in the advertisements and marketing materials. Evidence of this is demonstrated by this comparison of an original photo to a photo that was airbrushed before publication. Version 2 (V2) photographs have been found in the Ford Archives. No Version 1 photos have been found in the archives and we presume this is because Version 1 was still being handled by Shelby American. 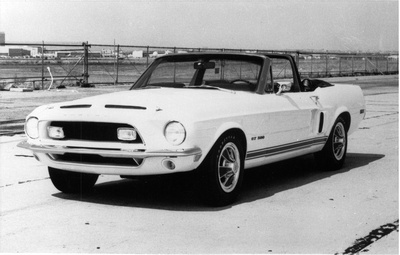 Note: There were a number of small differences between the convertible and fastback as they evolved through the process. Convertible: wearing original paint color -- Candyapple Red. Both ‘photographic styling’ cars captured with ‘67 10-spokes and wheel covers. The wheel covers on the photographic cars had an inverted paint scheme from what production cars would receive. 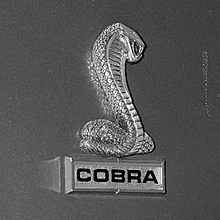 Wheel cover centers had an emblem of a rectangular checkered pattern behind a left-facing Cobra snake. The convertible is also captured wearing Ford Thunderbird 'turbine style' wheel covers during one LAX photo-shoot. The hood was a hybrid fiberglass over steel under-structure (just like the early 1967 cars). Visible differences between AO Smith's hand-build hood and '68 production hoods include: non-functional front scoop openings, rounded front corners of top louvers, sharper side edges of scoops, longer tips on front of scoops. Large hinge springs were used due to the steel under-structure. 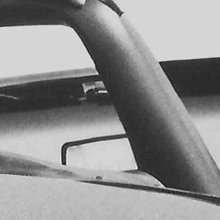 This front-end was moulded/fabricated as a single piece, not the four piece front end that production cars would receive. Marchal light pedestals are the only anchor to support brace (there are no additional visible bolts visible on the grille opening bottom return. The pedestals were blacked out to give the lights an appearance they were floating in the grille area. “S H E L B Y” chrome lettering on header panel is more condensed, approximately 19” wide, as compared to the 23” wide lettering that production cars would receive. Front grille is a pre-production variant with top-center area cut out for access to hood latch. The tail light panel made by A.O. Smith fitted with ‘65 Thunderbird tail lights. Note: The convertible 0139 was originally prepared the same as all ‘67 Shelby cars, with large, crudely-cut rectangular openings in the rear valence for the ‘67 Cougar tail light assemblies. Rectangular strips of metal were cut and riveted to the top and bottom of the oversized openings to add support for the new ‘68-styled fiberglass panel fitted with ‘65 Thunderbird taillights. 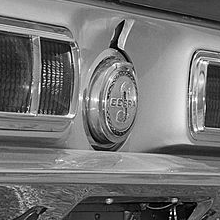 The chrome taillight bezels were attached with slotted (not Phillips) screws. Visible area around trunk lock was painted silver to blend with fiberglass panel. Convertible's deck lid was also fiberglass over steel under-structure. Unchanged from '67 styling applied to the car in the first week of December 1966. Hood locks are right & left ‘hairpin’ style click-pins with cables. Cables are fastened to the fiberglass return of upper grille opening. Emblem/stripe treatment #1 - left side of the car (v1-left) different is different from the right side of the car (v1-right). Functional marker lights cut into front fenders. Rear lower valance changed out for Mustang GT style (wide stamped openings for exhaust tips). This also eliminated the chrome trim pieces that Shelby originally fitted to the notched-out lower valance panel. Chrome exhaust tips are the new “pipe-in-pipe” design. Rear quarter reflectors were paper/cardboard mock-ups. Back of hood scoop is body color (not blacked-out). Convertible's front license plate bracket removed. Stainless steel wheel well mountings added. Chrome trim added around front upper and lower grille openings. Note: the trim isn’t metal -- it is a flexible chrome plastic body moulding. Marchal SEV 658 series spot lamp lenses (same as GT40). Fitted to upper grille opening. These are not the broad-beam fluted 653 series driving lamp lenses that were eventually used in production cars. 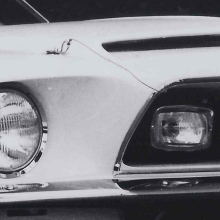 The pedestals of the Marchal driving light assemblies were blacked out to make the lights appear as if they are “floating” in the grille area. 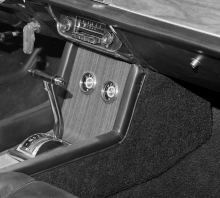 A toggle switch to control the Marchal driving lights was added to lower left of dashboard (below convertible power top switch). The switch appears to be the same switch as used on the Shelby Cobra. Goodyear Speedway 350 “small letter” tires (note: when car was discovered in late 1970's. the spare tire in the trunk was still as the factory delivered it, a Magstar with Goodyear large letter tire). Convertible top boot is stock Mustang type with the snaps painted black to hide them in the photos. 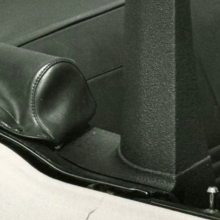 Note the two interior snaps on either side of the rear seat remained unpainted. Wood Grain appliqué applied over stock brushed steel ‘67 dash and ‘67 door panels. Interior console made by A.O. Smith. Compared to a production console, it is wider; the stitching, piping and seams different; the armrest is not embossed and is covered in Connolly leather rather than production vinyl. Front seats and center console are covered in black Connolly leather rather than production vinyl. Note: car 0131, the coupe known as 'Little Red,' also received a black Connolly leather seats. Stainless trim surrounding the ’67 seats and seat emblems were blacked out. Steering wheel with unique (small) center top pad and horn half-ring. Steering wheel believed to have be sourced from the Ford Thunderbird. Leather/vinyl-wrapped roll-bar with top clasps (which, according to the press release, were for “securing a surfboard or skis”). Large ‘67 style rear-view mirror relocated and mounted directly to front window (top windshield frame mount receiver still present). Seatbelts are ‘67 deluxe style, and shoulder harnesses were added. 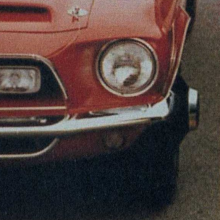 7" headlights are Tung Sol brand, as would have been used by Ford's San Jose assembly plant. 'Version 1' of the '68 photographic cars were photographed at Malibu Beach beach wearing ‘67 10-spoke wheels, at Shelby American facility at LAX sporting 15” steel wheels with Ford Turbine (C8AZ1130B) style wheels covers and then finally with Shelby full wheel covers in all subsequent photos of the convertible. Convertible has been repainted Wimbledon White. Clear evidence of repainting includes painted bumper support arms, painted body pinch-welds (both were originally black), and runs in the paint on the cowl (visible in the one engine bay photograph we've found). All other features, including the emblem and stripe treatment, remain unchanged from V1. 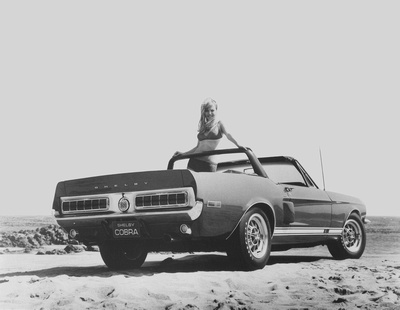 Version 1.5 of the convertible '68 styling car was photographed by the staff on the tarmac outside the LAX facility and then taken to the Hollywood Park horse racing track along with the Acapulco Blue Fastback for a professional photo shoot. DZUS hood locks with cables attaching them to inside openings of hood scoop replaced the click-pin locks that had lanyards anchored in grille opening. 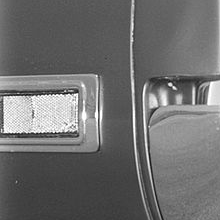 Quarter panels now appear to have early ‘68-style reflectors, though the quarter panel has not been cut or stamped with a recess. The mock-up reflectors in v2 are surface-mount only. Fuel filler cap emblem has been updated. Fender emblems appear very close to production, though they are actually two separately cast pieces. 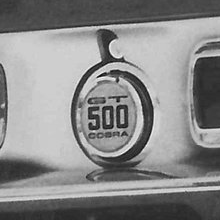 The snake piece is thicker and the rectangular “COBRA” portion has black lettering on a silver background with red and blue stripes above and below (a theme shared with the 427 Cobra's side emblem). 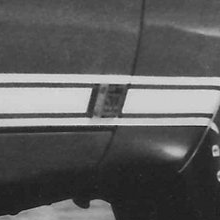 Rocker stripes are near production (though still ‘67 style - door justified model rather than centered like production ‘68). 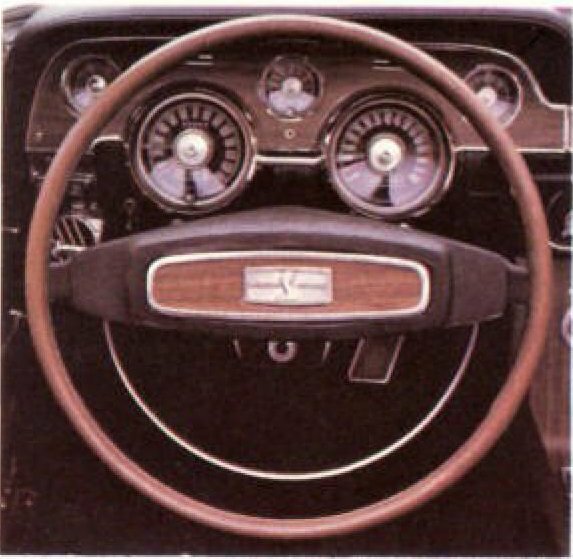 Dashboard emblem is now similar to ‘68 production style. Roll-bar and interior panels are updated - both appear to be molded fiberglass with a textured coating. Roll-bar no longer has top clasps. Convertible receives an updated roll bar. This version is textured and no longer has the ski/surfboard tie-down clips. Body pinch-welds have been blacked out, however, bumper support arms are still covered in white overspray. Back of hood scoop is now accented with what appears to be black vinyl tape. In at least one photo is appears that there may have been covered holes for turn signal indicators on the rear of the hood scoop. Under the hood, the factory dual-quad setup has been replaced with the setup from a 427 Cobra (intake, 715 CFM 4bbl carburetor and circular chrome air cleaner). Version 2 of the '68 photographic (advertising) cars were first photographed during 'press day' at the LLTC held at Riverside Raceway on July 7, 1967. Three days later on July 10th the cars were taken out and photographed in Idyllwild (California Mountains). Convertible fitted with 'regular-production' 4-piece front end and full fiberglass hood. 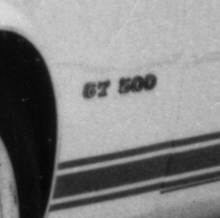 Fender emblems and model designation within rocker in stripe is now justified (centered on fender) as a ‘68 production would be. Brightwork added to rocker panels. Radio antenna relocated from front right to left rear. Marchal lights appear to still be the SEV 658 series spot-beam style. Emblems updated (gas cap, wheel cover centers, fenders, and dashboard). Convertible top boot modified (assume snaps removed). Interior trim panels get vinyl covered. - now appears wider at top than a production roll-bar. Note: Six items, including the updating of the seats, interior trim, roll-bar, emblems, wheel cover centers and top boot are mentioned on the handwritten Ionia documents - Jobs yet to be completed in California, items 4A-4F. Note: When discovered in 1976, the convertible was painted Acapulco Blue, had a rear antenna, had rocker moldings and 4-piece front-end. See the photos. The "1968 Shelby Advertising Cars Quick Identification Guide"
Wheels -- when wearing wheel covers, the paint is inverted from production colors. Centers also have a pre-production emblem of a rectangular checkered pattern behind a left-facing Cobra snake. Model designation in side stripe is door-justified like a '67, not centered on the front fender as the '68 production cars would be. No bright-work on rocker panels. Cables on hood locks -- either click-pins with cables attached to front grille opening -or- DZUS locks with cables attached to inside of hood scoop openings. Non-production emblems on sides, glove box and fuel filler cap. Often, the early color photographs found were often retouched (airbrushed, altered) to make the car appear as if it had production emblems and stripes. No embossed emblem on top of center console armrest. Front seats and console armrest may show clear signs that they are leather (convertible only).